Our elections are down to the home stretch. Voting begins at 9AM Friday March 1stand runs to 9AM Friday, March 8th. Welcome back (and a welcome to UMass Boston for any new NTT faculty)! We know you are busy with the start of the semester but we want to be sure you are aware of important language in the FSU contract regarding non-tenure track faculty. This language covers everything from just cause rights, to promotional eligibility, to paid sick leave, and more. Member voting is March 1st to 8th. Protest at the Board of Trustees meeting this Thursday, February 14 in Boston. 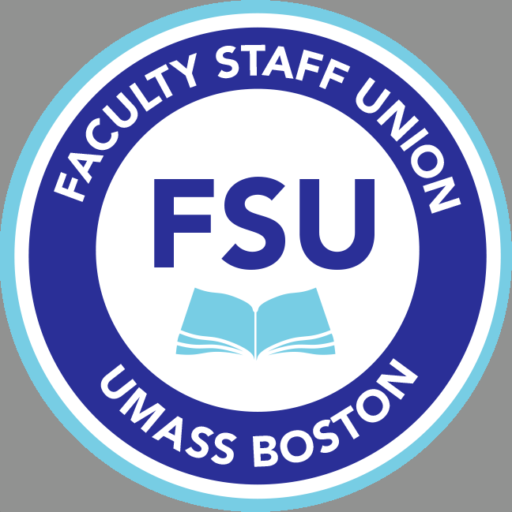 The Faculty Staff Union (FSU) holds an election every Spring semester for positions on the FSU Executive Committee. The deadline for nomination is 5pm tomorrow (Friday), February 8. Welcome back to the spring semester. For those of you just joining us, welcome to UMass Boston! ► FSU internal organizer for this semester. Sandra (Sandy) Howland, FSU member and union activist, (Senior Lecturer II, English), will be an FSU internal organizer this semester. Sandy will be working with the FSU to discuss with members their concerns and issues on campus and to increase membership involvement.